More often than not, the first time customers and potential prospects get in touch to enquire about our service is via email. 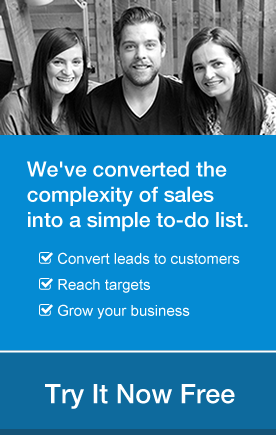 Leads get in touch with our support team, who create a contact in OnePageCRM and assign it to sales for nurturing. 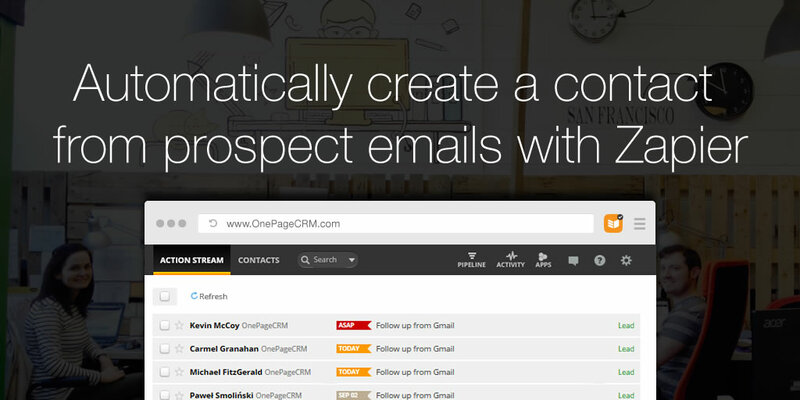 So this got us thinking, wouldn’t it be great if a new prospect could be automatically added to OnePageCRM, every time they got in touch, complete with a Next Action for sales to follow-up? Well, now you can! Zapier.com is a great app that allows you to integrate OnePageCRM with over 500 other apps like Zendesk, QuickBooks and Trello. They have a free plan in their pricing, so you can use it without any additional costs. Simply sign up to test all the integrations. So back to our idea of having new prospects created in OnePageCRM when they reach out to you by email. Once you have setup your Zapier account, creating your first ‘zap’ is very simple. In your Zapier account click ‘Make a Zap’. Select Gmail as your Trigger App by searching in available apps. Then select New Email as your trigger. Zapier will then ask you to choose and allow access to your Gmail account. Once your Gmail account has been configured, you can setup the trigger to take action in OnePageCRM. Select OnePageCRM as your Action App by searching in available apps. Then select Create Contact as your action. Now, Zapier will ask you if you want to use any filters or add all contacts from incoming emails. Since we want to have some sort of control over that (you do not need to have your partner as a contact in OnePageCRM for example) I would recommend choosing New Starred Email from the list. This way only new contacts marked with a star will be created in OnePageCRM. Next Action Date —> Select due date [today] or [tomorrow] etc. Once you have mapped your fields, Zapier will ask you to test the integration to make sure everything is working correctly. All you have to do then is name your Zap and make it live! Now once you star a message in Gmail, Zapier will create a new contact in OnePageCRM based on that email content. It’s as easy as that! Is there a way to create only the contacts that I specifically want as an OnepageCRM Contact. If this system automatically creates a new OnepageCRM contact for every incoming email then we will have too many new unusable contacts? You can set up certain triggers, for example – only send "starred" contacts to OnePageCRM, although there is a high risk of duplicates as Zapier cannot detect which contacts are already in OnePageCRM. I’d recommend using our email dropbox to decide what email’s are sent over to OnePageCRM and then you’re asked if you’d like to create a new contact or assign to an existing one. That gives you more control here.